That’s the advice my good friend Katie McGinty gave me when I was first thinking about running for office. We had just sold our company, and for the first time in 16 years, I wasn’t running a company. I’m proud of what we accomplished over that time, but having dedicated a career to trying to mitigate climate change, I was suddenly without a vehicle to drive towards that goal. What I wanted to accomplish with my life hadn’t changed. But to go back and start another company would have been going back to a job I had already done. Katie knew that I had the goal, but was implicitly asking whether I needed the credit. I don’t. And in my experience, none of the most successful CEOs do. Yes, the big ego, high profile CEOs get the media attention. But for many of the most successful companies in the world, you can’t name the CEO. There’s a reason for that. An organization that depends on one hard-working visionary is always limited by the ability of that one person. Humble CEOs who attract good people are the only ones capable of real, transformative growth. What Harry Truman said about Washington is no less true of any large organization: it’s amazing what you can accomplish if you don’t care who gets the credit. But there’s a flip side to that axiom. Being willing to allow success to happen even when you don’t get credit also sometimes means that you have to keep your ego in check when you’re getting unfairly blamed. This was Katie’s larger point. Being a member of Congress means having lots of people blame you for things you didn’t do, misunderstand things you did or pressure you to take the fall for something you aren’t responsible for. This is no less true of running a company. Your job as a CEO isn’t to promote yourself— it’s to make sure you honor the interests of your investors, customers and employees. If that requires a personal sacrifice, you do it. And if that’s a problem, you’re in the wrong job. My first exposure to this lesson was when I was running Turbosteam, a Massachusetts-based manufacturer of custom-built industrially-integrated power plants. We built a project for a hospital in New York as a subcontractor to an energy services company with a larger, hospital-wide energy efficiency agreement. Our customer — who I’ll call ESCO out of respect for the privacy of all involved — ended up being sued by the hospital for failure to achieve various schedule and energy savings commitments within their contract. Late in their litigation, as it became clear that ESCO was likely to lose, we received notice that we — along with several other of their subcontractors — were being named as co-defendants. Needless to say, this caught me by surprise, and made me angry. We hadn’t breached any of our contract provisions, but suddenly I had to hire a lawyer and spend a lot of time disclosing our old emails, sending our employees to give depositions and expending significant personal time trying to calmly and precisely say “NONE OF THIS IS OUR FAULT!”. It was, in short, a nuisance suit, designed not to prove guilt but rather to intimidate us into paying some of the costs that ESCO was on the hook for. A classic shakedown. So I learned how to be a CEO-defendant. I learned how to answer every question with exact precision, ideally with “Yes”, “No” or “I don’t recall,” and to be absolutely truthful. I learned to depersonalize when their lawyer made attacks on my character. My lawyers kept telling me to pay attention to how the judge was likely to read my body language. I was cautioned to speak more precisely, lest a single sentence from a stenographer’s transcript be taken out of context. Several months and tens of thousands in legal bills later, I was called into the judge’s chambers. He pointed out to me that while we were likely to prevail on the merits of the case, the amount of evidence and testimony we’d have to provide to demonstrate our innocence was likely to require at least another $100,000 worth of legal bills. He didn’t want to waste limited court time either, and suggested that if we could propose a lower settlement value, he could probably convince ESCO to accept and close the case. So there I was, knowing we were right. Knowing the judge thought we were right. Feeling completely abused by the legal process. Feeling angry that this whole thing was going to cost our company a lot of money. Feeling self-righteous. But also recognizing that you don’t get to play the cards you wish you have. You play the cards you have. So we took the settlement, the case was closed and we got back to fulfilling our mission, knowing that we’d done the best for our investors in the circumstance. Learning how to spot unethical behavior and respond to it is not a skill I ever really wanted to have. But it’s a necessary skill in any environment where you may have cause to work with people of less-than-pure motives. And would prove useful several years later when we got involved in a much bigger bit of litigation. When I was the CEO of Recycled Energy Development, we depended significantly on outside investors to provide the capital for the clean energy projects we built. We’d already sunk as much of our own savings into the business as we could, but each new project required more capital and each new infusion of capital necessarily required giving up a bit more control to those investors. We managed to retain majority control of the equity and in the board, but had ceded rights to control future investment decisions relating to both debt and equity financing to our outside investors. We also granted them with the right to gain majority control if we failed to achieve certain financial valuation metrics. As our capital needs grew, our Board gradually became concerned that one of our investors was seeking to block investments in order to drive down the value of the company and unethically seize control. Our fears were heightened when that investor — after hamstringing our growth efforts — then opportunistically called for a revaluation of the company under terms that would have forced a shift in control. And so we went to the courts, and asked for injunctive relief — in non-legal speak, that means that the court would direct us all to follow the precise terms of our operating agreement. We weren’t asking for money; we were simply asking the court to enforce the deal we’d reached, fair and square. Given the adversarial nature of the US legal system, the specific request of the court was framed as litigation against our problematic investor. So we fought back. We spent several million dollars in legal fees defending ourselves from those claims. All while still running a company that had daily obligations to provide reliable heat, electricity and other utilities to over 60 businesses and meet our obligations to our other investors. Was I happy about this? No. But again, I had to play the hand I was dealt, not the hand I wished I had. And in the meantime, we still needed capital to fund our various customer and regulatory obligations. So we quietly initiated discussions with various outside parties to sell our company. We couldn’t hide the situation we were in — after all, this was all a matter of public record — but we also had to make sure that we delivered economic value for our investors. These people had been with us since the beginning and I was not going to let them down without a fight. Ultimately, we received two binding offers to sell the company and closed the deal. We made money for our investors. We got the buyer to commit to maintaining our commitments to employees, and to fund the capital improvements that started the process. We got all litigants to dismiss their litigation against one another. We made lemonade out of lemons. Best of all, the company fulfilled its mission to make the investments necessary to drastically lower CO2 emissions, reduce energy costs and turn a profit. And a few months later, I found myself talking to Katie. As the head of Pennsylvania’s Department of Environmental Commission, she’d had to defend frivolous lawsuits all the time, and she courageously pressed forward. And I found myself looking at my own representative, Peter Roskam and asking whether he passes her test: Was he capable of doing a hard, often thankless job and receiving no credit, in order to accomplish something really important? Not as far as I could tell. When I met with him as a CEO to ask him to advocate for clean energy tax credits, he got up and walked out of the room rather than engage on substance. That is not the behavior of a man who is comfortable articulating what he stands for. In the 10 years I’ve lived in his district he has yet to hold a public town hall to explain what he stands for. I suspect he knows that our President is engaging in dangerous actions and refuses to act or even speak out. He has the gall to have a video on his website explaining why he supports the Violence Against Women Act — a bill he voted against. Again, this is not a man who is willing to articulate what he wants to achieve, or to put himself through any discomfort to achieve it. I was left feeling like Peter Roskam won’t fight for me, won’t fight for my family, and won’t fight for our country’s future. I’m not perfect, but I am not going to run from a fight just because it gets hard for me personally. I hope that if I am fortunate enough to replace him, I will demonstrate that with courage, conviction, and honesty, we can stand up, together, for what is truly important. 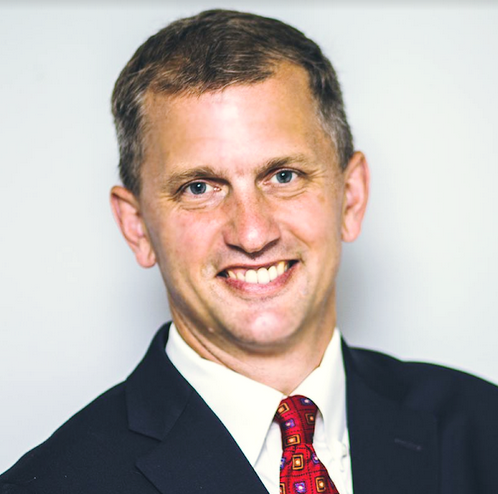 Sean Casten is the Democratic nominee for Congress in Illinois’ 6th Congressional District. To learn more about Sean, visit www.castenforcongress.com.